Every year in Canada, roughly 65 children are diagnosed with neuroblastoma. Thomas Mueller was diagnosed in 2007, and fought the disease with immense courage and bravery. Thomas died early on September 30th, 2011, in his parent’s arms. Peloton 65 is a growing group of cyclists, family and friends united in the fight against neuroblastoma. We’ve already raised nearly $100,000 to date and our fundraising efforts will continue to benefit the Thomas Mueller Phage Display Project through the Alberta Children’s Hospital Foundation. 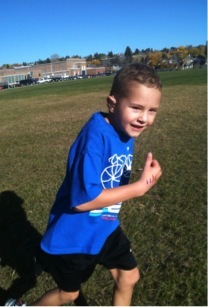 The Annual Walk For Thomas is our flagship event and it’s held every September in Calgary, along with friends and family participating around the world. This disease needs to be stopped. Please help with your donation. If you have any questions, please contact us at peloton65@gmail.com.